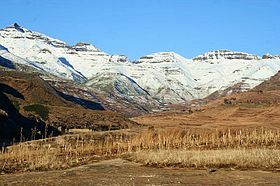 The name 'Drakensberg' is derived from the dutch and means "mountains of the dragon". The mountain range is the highest edge of an ancient plateau, the Great Escarpment, which covers most of the interior of South Africa and extends into neighboring countries. This article uses material from the Wikipedia article "Drakensberg", which is released under the Creative Commons Attribution-Share-Alike 3.0 License.